Emirates, Etihad, flydubai, Air Arabia and Al Fursan took to the skies in unison today to celebrate the UAE’s 47th National Day, as well as commemorate the legacy and values of HH Sheikh Zayed, the late founding father of the UAE. Today’s formation flight aims to showcase the country’s aviation success story to the nation and world. See the stunning footage here. The spectacular flypast – a world-first and a UAE civil aviation milestone – involved over 11 aircraft: a flydubai Boeing 737 MAX 8 (Zayed 1), an Air Arabia Airbus A320 (Zayed 2), an Etihad Airways Airbus A380 (Zayed 3) and an Emirates Airline Airbus A380 (Zayed 4), as well as seven Al Fursan aerobatic display jets from the UAE Air Force. All of the commercial aircraft within the formation were emblazoned with ‘Year of Zayed’ decals. This is also the first time this unique combination of aircraft types fly in formation. The aircraft were proudly commanded by Captain Adrian Smith from flydubai, Nadhem Al Hamad from Air Arabia, Captain Richard Dyson from Etihad Airways and Captain Abbas Shaban from Emirates Airline. The Al Fursan team was led by Lieutenant Colonel Nasser Al Obaidli. The carefully choreographed ‘stair step’ aerial formation began this morning at 1300hrs, when the aircraft took-off from Dubai World Central Al Maktoum International Airport. Once all of the aircraft established their holding positions with altitudes ranging from 2,000 feet to 5,000 feet with a 1,000 foot vertical separation, the formation commenced. 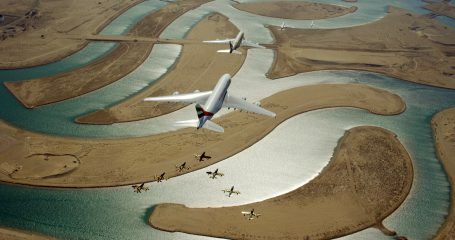 Over the skies of Ras Al Khaimah, each aircraft adjusted its speed and turned to achieve a trail formation. The aircraft then descended into their positions and vertical separation was reduced to 300 feet. Flying first in the ‘Year of Zayed’ formation was flydubai, cruising at an altitude of 1,000 feet and an airspeed of 210 knots, closely followed by Air Arabia, in line astern and stepped up at an altitude of 1,300 feet. Next came the Etihad Airbus A380 double-decker, trailing the first two aircraft and flying at 1,600 feet, stepped up by the Emirates Airbus A380 flying at the highest altitude at 1,900 feet to make room for the seven Al Fursan jets set in an arrow formation ready to release their signature smoke trails in the colours of the UAE flag. Together, the stunning UAE carrier formation flew with impressive precision across the coastline of the UAE, starting at Ras Al Khaimah, continuing on to Um Al Quwain and Ajman, and then passing landmarks including the Sharjah Corniche, Dubai’s Palm and World Islands with the Burj Khalifa skyline in the background, and finally crossing the Abu Dhabi Corniche and the Sheikh Zayed Mosque, where all aircraft then split and continued on to their respective airports for landing. While the flawlessly executed aerial formation flight may appear to be a straightforward assignment, the mission was under planning for more than five months due to the complexity of the formation and the number of aircraft involved. With a primary focus on flight safety, the meticulous technical planning and co-ordination involved all four airlines and multiple regulatory stakeholders. A rehearsal flight was done on 8 November 2018 to ensure that the formation positions worked appropriately with the Al Fursan air display team. The test-run ‘Year of Zayed’ formation also included two helicopters and an Aero L-39 Albatross chase plane from the Latvian based Baltic Bees aerobatic display team to film every detail and aspect of the formation. The “Year of Zayed” is a tribute to HH Sheikh Zayed’s remarkable legacy which has left a lasting imprint on the UAE. The inspirational leader created a vision of prosperity, determination and tolerance – attributes that remain strongly embedded in UAE culture and across all UAE aviation organisations.